So many times I've found myself writing about wonderful events and times of the year that are current, here in Umbria and Tuscany. My philosophy has been that our readers might be inspired by these profiles and want to plan trips around them for the following year. This time, I will talk about olive picking in Umbria. Some agricultural estates in Umbria offer olive harvest holidays, you can participate in the harvest as much or as little as you want and take home extra virgin olive oil from Umbria, which is considered among the best of Italian olive oils. So, if any of you are coming to visit this autumn, you may want to add this idea to your itinerary. I hope you enjoy reading this blog article as much as I have enjoyed researching and writing it! November is the month to pick olives. The earlier the better. In most Mediterranean areas, olives are harvested in the months of November, December and January. But here in Umbria, where cooler valleys are sometimes touched with early frosts, the harvest can begin as early as the end of October. Our early harvest means that the fruit is less ripe, and therefore produces less oil, making Umbrian olive oil a bit more rare than others. The less ripe olives also account for the prized peppery taste of our oil. Of course, we love this special oil, and its arrival is always cause for celebration. Olives are still picked by hand, and they are combed from the tree branches with a long instrument that resembles a strange pair of scissors, and then put into baskets. While some areas are using more mechanical methods of harvesting the olives, these are not yet ideal, as they can damage both the olives and the trees. The old method still prevails. In Umbria, the olives are always picked by hand, for Umbrians do not believe that an olive that falls to the ground is worthy of our fine olio; such an olive could be damaged and spoil an entire pressing. Because it is done by hand, olive harvesting is difficult work. Usually, the entire family, and often their friends, are called upon to pitch in with the farm workers for the harvest. The olives are picked while green and timing is vastly important. Once the fruit is off the trees, it must be rushed to the press in order to avoid spoilage. An olive is 20 percent oil, and while this may not seen like a lot, the high fat content can cause the olives to spoil quickly. Fermentation also becomes an issue once the olives are picked. So, it is on to the presses as quickly as possible. 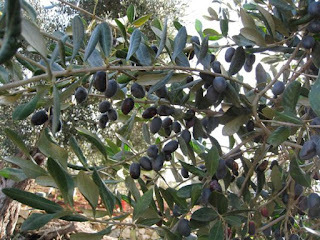 It takes a lot of olives to produce a liter of oil; about 200 hundred per liter is an average number. However, among the finest oils, it sometimes takes the fruit of an entire tree to produce a liter. In Umbria, as in most of Italy, the olives are pressed at a communal mill which is called a Frantoio. At the frantoio, many growers bring their olives to be pressed, but each grower is proud of his olives and comes along with them to the mill, to be sure that only his harvest goes into the pressing. Each grower must make an appointment for his pressing, and sometimes his entire family comes along to await the final product.